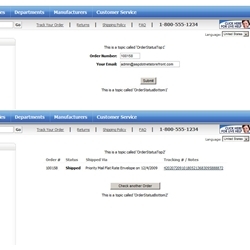 Give your customers the ability to check their order status without the need to login. - Easy installation instructions included in the download. I LOVE this! It is so simple and works great. It will save my customer service department hours of time every day. It is ridiculous that Storefront does not allow non-registered customers to check order status. Even for registered customers, the vast majority just want to know if their package was shipped and what the tracking number is. Sending them to a clutterd account modification screen was not a good user experience. Thank you for making this!! !